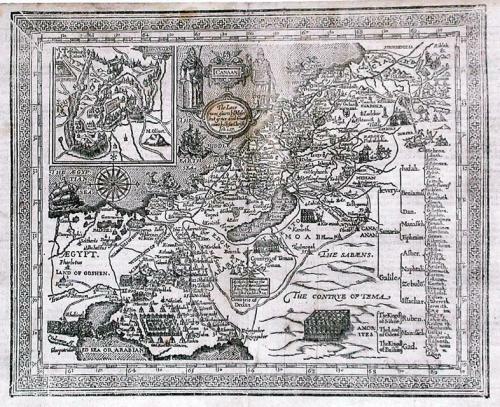 Description: This is a Map of Canaan from a 1637 King James Version edition of the Holy Bible. In the center of the Map, under the figures of Moses and Aaron, it says: The Law was given by Moses but grace and truth came by Jesus Christ John 1:17. In the inset, upper left corner, is a view of Jerusalem with Mount Calvary in the top right corner. The tribes of the children of Israel are listed on the right hand of the Map. The route taken by Abraham is shown as is the flight of the children of Israel out of Egypt. On the verso there is a detailed description of Canaan, and the bordering Countries with Scripture references. Condition: The map has been de-acidified. The centerfold and edges have been strengthened, without loss. Staining.